Here’s a puzzler: I write and talk about books for a living (in two different jobs), yet I absolutely cannot write about books. Or at least not the books that I love to my core. If I really love a book, I am terrified to write even a paragraph about it, which I thought was probably because I’m afraid of not doing the book justice. But the truth is that I want to keep it inside my head, in some sort of cloud bubble of perfection, surrounded by emotions and visceral reactions, without concrete words to bring it down. 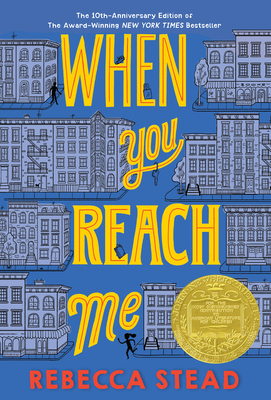 Such is the case with When You Reach Me by Rebecca Stead. Anyone I know has heard how much I love this book, yet if someone asks me to explain why, I clam up. This is a book that shook me to my toes when I read it, reminding me not only why I want to write, but why I want to read. Tonight I saw Rebecca at a book event in Seattle. She is unassuming, engaging and completely delightful. And now I love her all the more because she said tonight how she can’t talk about the books she loves most, wanting to keep them in that fragile world inside her head.